Having dehydrated, dry, and oily skin, and acne all at that same time are a difficult combination of problems that seem impossible to handle. But once you understand what's happening plus which products you need to use (and what products to avoid), you can assemble an ideal skincare routine and start seeing impressive results. What is Dehydrated, Oily, and Acne-Prone Skin? This combination of skin problems is recognizable when the surface of skin is dry or flaky with a layer of oil sitting on top, all accompanied by blemishes (either a lot or a little). In terms of dealing with the dehydrated, dry part, thankfully it’s often a temporary condition caused from using the wrong skincare products. However, although acne and oily skin can persist because they are almost always inherited disorders, they can also be exacerbated by choosing the wrong products. 1. If you are using skincare products that aren’t right for your skin type (too emollient or too drying) or contain harsh, skin-aggravating ingredients, you could be causing your skin to be oilier, drier, dehydrate its surface, and possibly even cause more breakouts. 2. 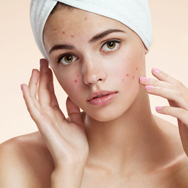 Even more problematic is if you aren’t using anti-acne products containing salicylic acid (BHA) or benzoyl peroxide. These two ingredients are basic to getting breakouts under control. 3. Without question, changing to the right products usually relieves the problem or at the very least will lessen the severity and eliminate a dehydrated, flaky surface. Using products that contain high amounts of natural or synthetic fragrances, including fragrant oils. Foregoing daily sunscreen use—sun damage plays a significant role in permanently disrupting the surface of skin. Eliminating these faulty practices will go a long way toward getting your skin back on the right track, but you also need to choose your anti-acne skin carefully because not all of them are created equally! Numerous studies have shown that salicylic acid (BHA) and benzoyl peroxide are essential anti-acne ingredients and the first over-the-counter choice before you seek professional attention. However, many products containing salicylic acid (BHA) and benzoyl peroxide also include skin-aggravating ingredients that can increase oil production and cause flaky, dry patches at the same time. That’s why it’s so critical that you choose anti-acne products carefully. Even the best anti-acne skincare routines can go awry if you get overzealous, don’t monitor how your skin responds, and you don’t choose the appropriate skincare routine to complement your anti-acne products. For example, for some people you may not need to use both a salicylic acid (BHA) and a benzoyl peroxide product. For some people, one or the other is fine and it would take experimenting to see what works best for you. Another way to experiment is applying the benzoyl peroxide product one day and the next day use the salicylic acid (BHA) product. You can also experiment with using the salicylic acid (BHA) product during the day and the benzoyl peroxide product at night. Products with retinol, niacinamide, and vitamin C can also help because each ingredient works to improve a dull, uneven skin tone, minimize pores, and has skin-restoring properties to help skin get back to looking and feeling normal. Because of your unique skincare needs, you will need to find a middle ground to address the entire combination all at the same time. That means using a skincare routine whose formulas are lightweight enough so they don’t clog pores or make skin oilier (no emollient products). This next part is crucial: Each leave-on product in your routine must contain an ample amount of beneficial ingredients to get skin’s surface back to normal. This means selecting gentle cleansers, liquid toners filled with skin-replenishing ingredients and a serum or moisturizer with a fluid or lotion-like texture complete with skin-restoring and replenishing ingredients and an array of potent but soothing antioxidants. And of course a broad spectrum sunscreen for daytime. Along with your anti-acne products this routine can help you achieve the best skin of your life. That’s what we hope this information lets you achieve! If you still find yourself a bit confused on which products to use, contact our Paula's Choice Client Services Experts for a personalized skincare consultation! Learn more about combination skin. Jeremy A, Holland D, Roberts S, Thomson K, Cunliffe W., Journal of Investigative Dermatology. 2003;121(1):20-7. Tanghetti E. Journal of Clinical Aesthetic Dermatology. 2013;6(9):27-35. Bhate K., Williams H., British Journal of Dermatology. 2013;168(3):474-485. Simonart T., American Journal of Clinical Dermatology. 2012;13(6):357-64. Bowe W, Shalita A., Seminars in Cutaneous Medical Surgery. 2008;27(3):170-176.